We see the masses in Tunisia, in Egypt, in Libya, and we rejoice. We rejoice for the rare illustration of that most deeply held human belief — that the people must not be subject to the leadership they do not choose. We rejoice, and yet we are conflicted, because we feel ground under a similar despotic heel, with no relief in sight. The voice of the people can depose Ben Ali, Mubarak, Gaddafi. But can it not exile Isiah Thomas? We needed merely to see the headline of Adrian Wojnarowski's column on the growing influence of Isiah to feel deeply unsettled. That same feeling of heavy stones in the belly that Haitians must have felt when they read of Baby Doc Duvalier's return, or that of the French upon Napoleon's return from Elba. Had not we cried out with a common voice, "enough?" Isiah Thomas, singlehandedly yet not without an imprimatur, made the Knicks from a bad team into a bad team and embarrassing franchise. There were the ludicrous trades and senseless signings, the sexual harassment suit and the illegal workouts that continue to harm the team even today. Thomas not only continually razed the rebuilding, but salted the earth behind him. Only this year, after Donnie Walsh's cap space hoarding came to fruition, is the team finally relevant for the first time this century. And then, Carmelo. When a player all but publicly announces he will only play for one team, it should seem a coup for that team to get him at a discount. Walsh knew this; he refused to commit to anything, holding out for the trade deadline when the Nuggets would have to take the Knicks offer, or no offer. Yet over All-Star weekend, things went downhill. Now, they speak of giving up Felton, and Gallinari, and Chandler, and sure, why not, take the big Russian kid too. The rumors seemed so at odds with what Walsh had set out to accomplish, and had stubbornly stuck to his guns for over the months. And then, Isiah. The news that Thomas "is calling the shots for New York" wasn't precisely a surprise; rather it's the obvious explanation for the rapid decomposition of strategy and principle that had recently served the Knicks so well. Isiah's back, they say, and he wants more. He wants Melo now, whatever the cost. He wants Walsh out. He wants his old job back. He wants all these things, he and one lone ally, while the fans, the media, the minds across basketball do not. This is life under a dictatorship, NBA-style. Thomas is not the despot here; that would be James Dolan, who had the money and therefore the power. And he is a despot in the strictest sense: born into privilege, had his empire handed to him, is completely deaf to the plaintive cries of his subjects, controls the media apparatus, has absolute power. 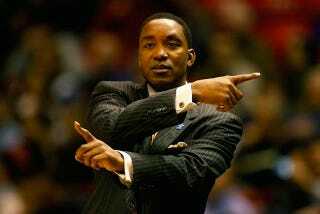 If James Dolan wants Isiah Thomas back, Isiah Thomas will be back. And no amount of columns, of boos, of angry mobs storming MSG demanding their voices be heard will convince him otherwise. This is the sad world of the Knicks fan, one without hope of a better day as long as Dolan rules and Thomas exists. We have wearied of speaking out, because we have seen over the last eight years all the good that will do. Instead we turn that last refuge, a deus ex machina: praying that David Stern will save Dolan from himself, and forbid Thomas's involvement because of his FIU job. We are left with our faith in a higher power, a foolhardy faith when the highest power in our Garden Temple is James Dolan, with his mad prophet Isiah.